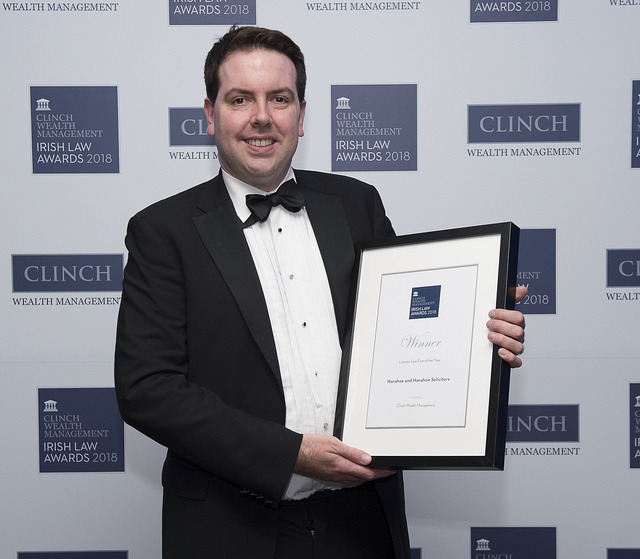 Three Kildare solicitors received awards at the Irish Law Awards 2018 in Dublin last Friday. Tim Kennelly, of Tim Kennelly Solicitors won the 'Excellence in Client Service Leinster' category, while Luke Hanahoe of Hanahoe and Hanahoe Solicitors picked up the award for Leinster Law Firm of the Year 2018. Allan Shine, CE of Kildare Chamber said, “ We are delighted that two members of the Chamber are celebrating this week with winning these prestigious awards”. Susan Webster of Susan Webster & Company Solicitors won the Leinster Family Law Solicitor of the Year Award. She said; “I am absolutely delighted to win the Irish Law Award 2018 for Leinster Family Law Solicitor of the Year. It is a huge honour. Susan Webster & Company Solicitors continues to grow and serve clients in Kildare and nationwide. Many thanks to all my clients and colleagues for their continued business, support and well wishes”. The Irish Law Awards were established in 2012 with the aim of identifying, honouring, and publicising outstanding achievements, while also recognising those who have dedicated their lives to serving in the legal profession. The Irish Law Awards 2018 were held in the Clayton Hotel Burlington Road last Friday May 11 with a black tie gala dinner hosted by Miriam O’Callaghan.